Welcome to Southport Park, home of the Boggy Creek Airboat Rides. The trees are beautiful here with their Spanish Moss. Looks like we need to go to the left. Some Gators from Gatorland are on display in the courtyard. The gator skins are pretty neat to look at. The main reason we are here is for the Airboats. Looks like one is heading out. Here is the one that we will get to board. We got a really good driver. He was very knowledgeable about the area and knew where to look for gators. Heading out from the dock area. It is crazy that the water is only 3-4 feet deep. It gets a little windy when he opens it up. The first of many gators we would see on our trip. We actually a full boat. We are really enjoying our trip. Yes. Those are cows out in the water. Apparently they don't care that there are a lot of gators out here. Heading back into the docks. 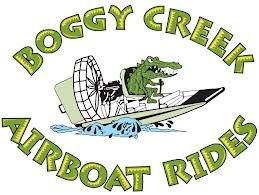 If you get the chance, we highly recommend visiting Boggy Creek Airboat Rides.